I mentioned in my last review that the last time I had risotto, it wasn't that great. 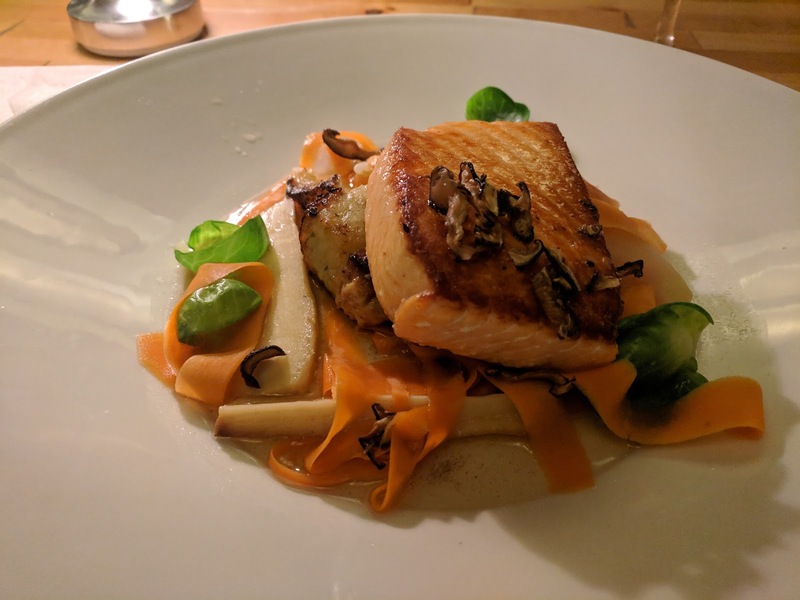 However, the salmon was excellent, which brings me to my post-Christmas dinner at Avenue Bistro in Comox, when I was back in British Columbia for the holidays. Formerly the Jolly Giant convenience store, the space on Comox Avenue has been renovated and remodelled to house this reasturant, which spcializes in locally-sourced ingredients. Love the concept, but they didn't execute it as well with ingredient explinations on the meny as they did at 10 Acres. Anyeay, there have been a lot of cool new reasturants popping up in the Comox Valley since my younger days, and I try to visit one each time I'm back. 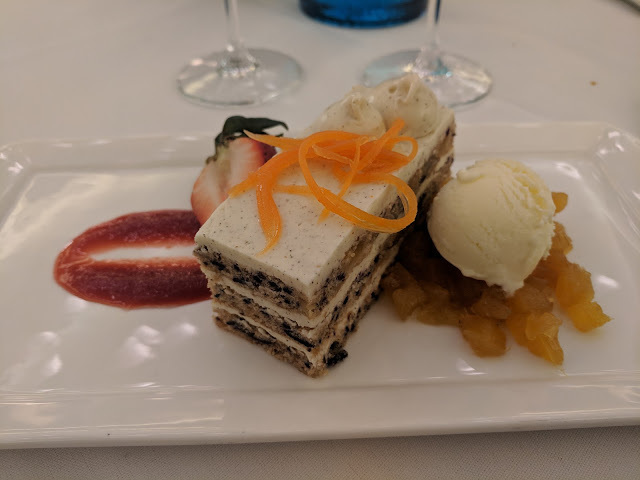 I'm all about the seafood when I'm back in BC -- nearer the source, after all -- and while they probably don't buy their fish at the wharf, Avenue Bistro is just a few blocks down from where the fisherman sell their catch in Comox. So, seafood was on the menu for me. 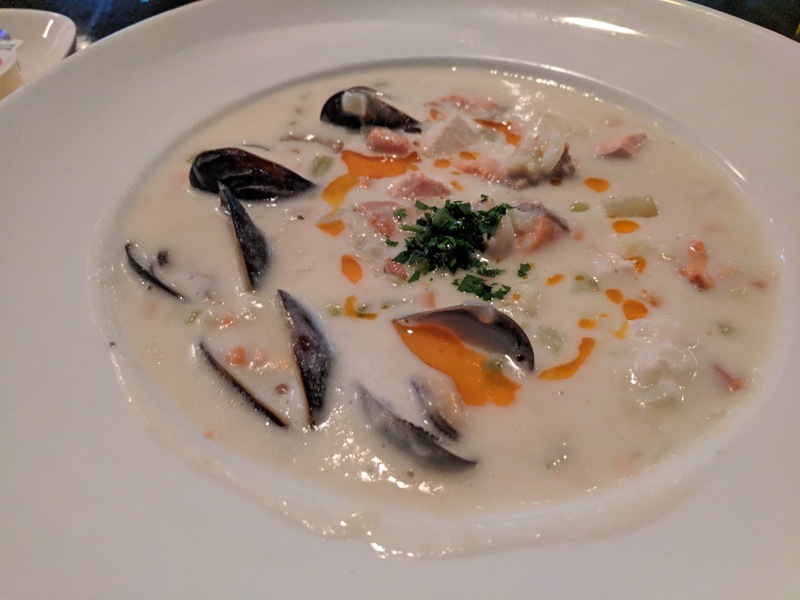 I began with the seafood chowder, which was generously stocked with house-smoked wild sockeye salmon, shrimp, cod, mussels with freshly-baked focaccia bread. Mmm, delish. A flavourful broth with sooo much delicious seafood. I hate when they serve you a thin broth where you have to search for the seafood and they use potato as filler. Definitely not the case here, so good. Sadly, I can't be as effusive with my praise of the entree. 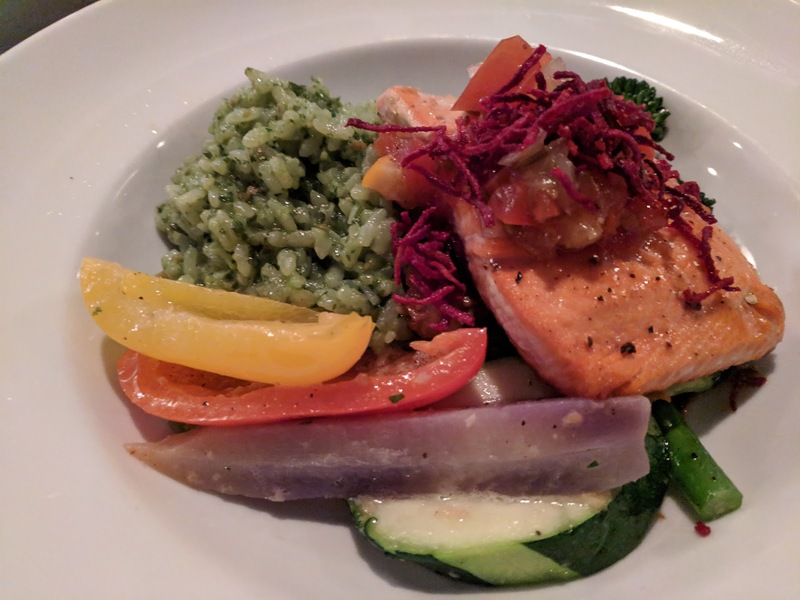 I ordered the Wild Pacific sockeye salmon with risotto verde, roasted veggies fennel tomato relish and beet straw garnish. First, the good. 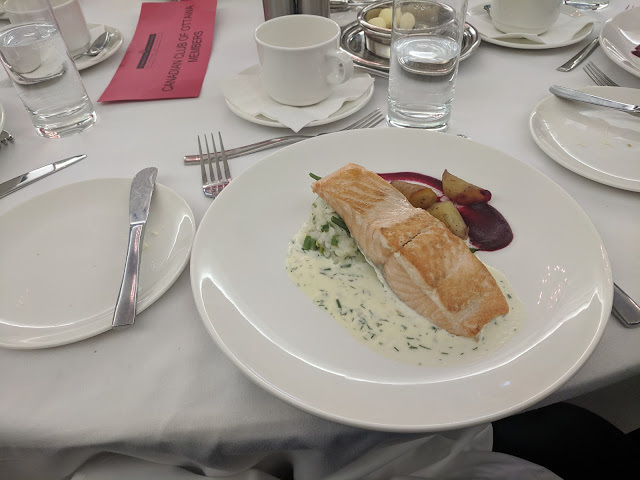 The salmon was delicious and cooked perfectly. Wild really does taste better, and Pacific salmon is the best salmon. The roasted veggies were tasty. But I did not care for the fennel tomato relish, just not to my taste. And the risotto verde? Never again. There was a very strong taste -- maybe cilantro? -- that just did not agree with me. I love risotto, but whatever this overpowering ingredient was just ruined it for me.When I had my leftovers for lunch the next day, I added a generous helping of cheese to the risotto to cover the taste. 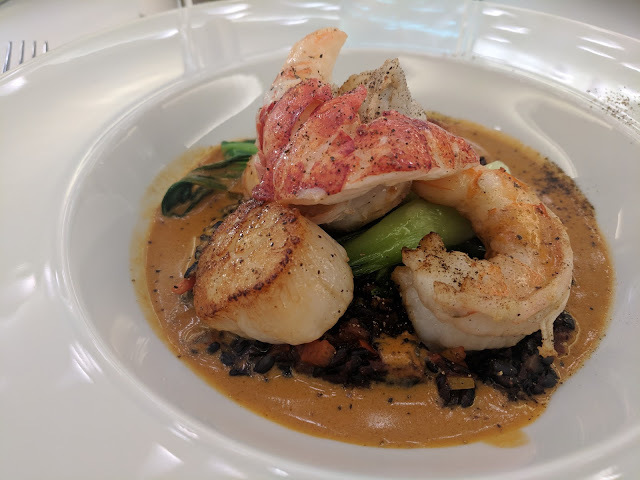 A welcome addition to the Comox Valley dining scene, but if you don't like cilantro, or whatever it was, avoid the risotto verde. 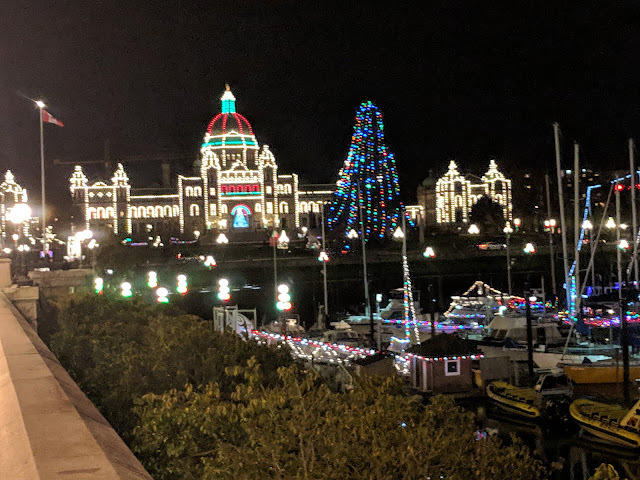 Back West in the Comox Valley for Christmas, and the other day we drove down to Victoria to spend the night, and pick up my sister and nephew. 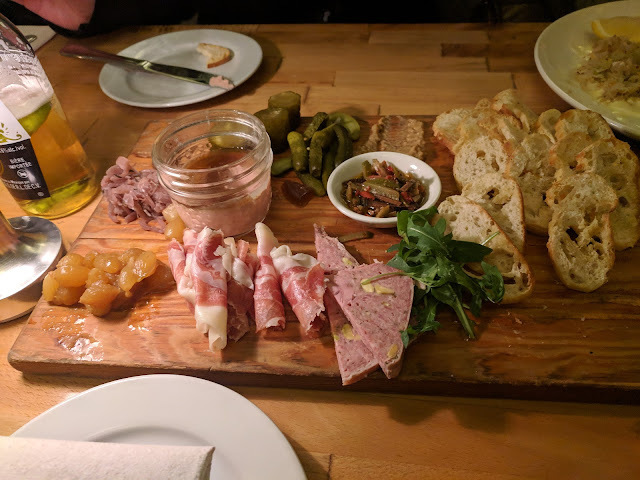 An opportunity for a nice local dinner, and the farm to table menu at 10 Acres Kitchen ticked all the boxes. Just down the street from the Empress, 10 Acres is a higher-end dining option, but it really does offer quality for the price. 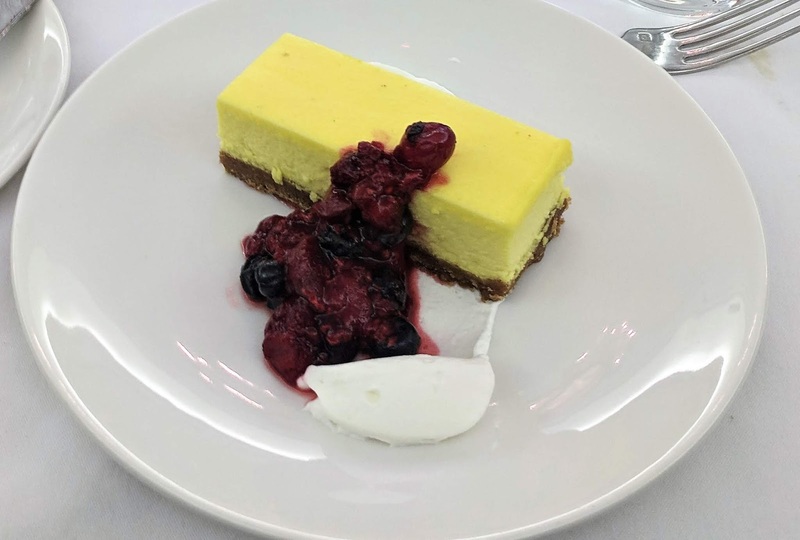 The reasturant sources much of its foodstuffs from its own farm in North Saanich, from veggies, fruit and honey to ethically-raised livestock. They also source from other local farms and seafood producers on Vancouver Island. I was set for the five-course tasting menu, but as the rest of the table was not I had to get more tactical. 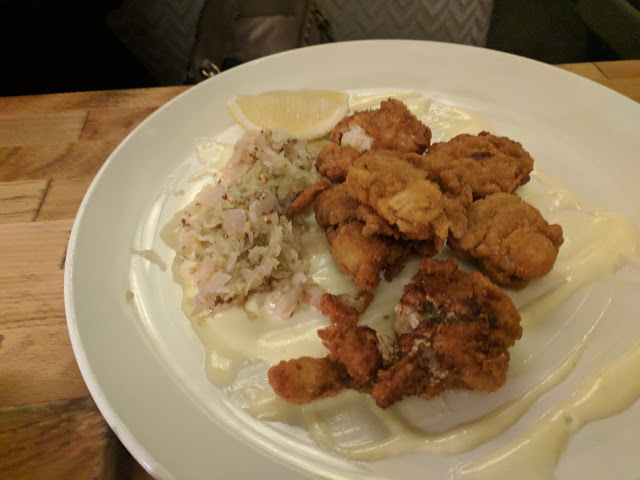 My sister and I agreed to split two appies for the first course: the Toast and the Pan Fried Oysters. 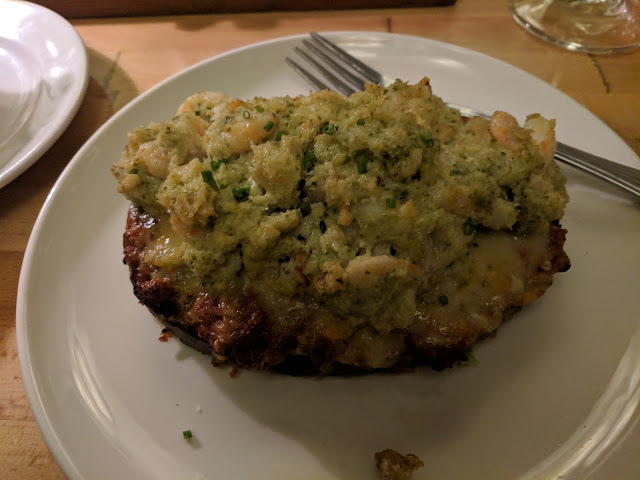 The Toast is dungeness crab and hand peeled shrimp with basil, romesco and gruyere served atop a thick slice of toast. 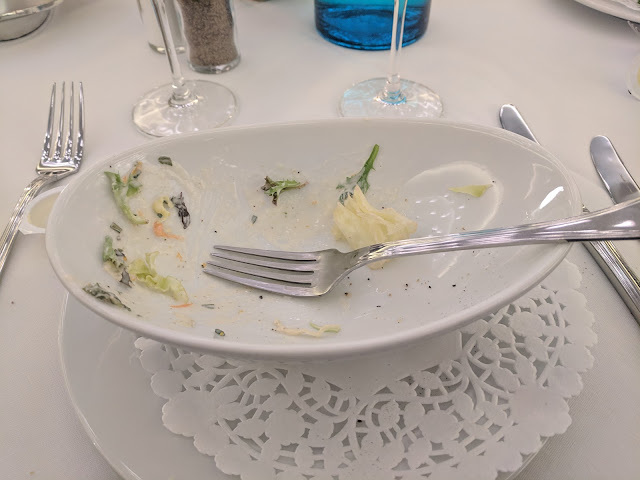 It was a plentiful portion and very tasty, but I did find it a bit too salty. Still, a tasty appetizer. Next up was the Pan Fried Oysters, which is breaded and fried Fanny Bay oysters served with preserved lemon aioli and pickled red onion. I actually have a connection to Fanny Bay Oysters -- one summer when home form university I did some general labour for them, seeding beaches, and later harvesting beaches and bringing them back to the facility for processing. I've never really been a raw oyster person though, so I was keen to give the fried oysters a try. They were fine, but not something I'd go out of my way to order. Just not my jam. As there was going to be a delay with our entreers with the kitcken was backed up, they brought us a complementary chacutiere tray to occupy us during the wait. 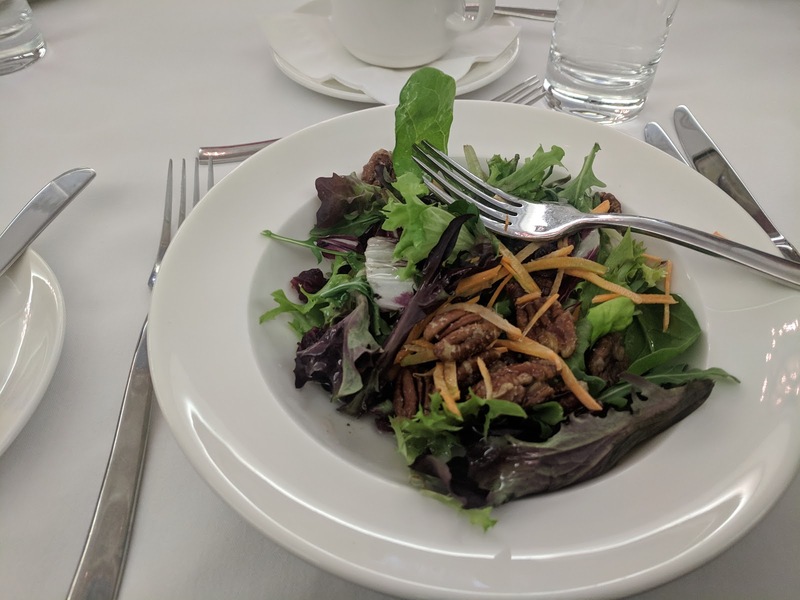 Much of the stuff was fancier than I usually eat, but I enjoyed the Ossabaw pork and the roast garlic. When we had our fill of chacutiere , our mains were ready. I had ordered the Chinook salmon (ocean wise, of course) with smoked Albacore tuna rice. Now, I was concerned about the rice as I don't really like tuna. I asked the waiter and he said it was prety tuna-ish but that I'd enjoy it, so I decided to go fot it. Maybe he got them to make it without tuna and didn't tell me, or maybe it's high end tuna with no tuna taste, but I got no notes of tuna out of this rice brick that served as the bed for my perfect morsel of salmon. Instead, all I got was baked, cheesy deliciousness. The salmon was pink, flaky and perfec, tand the accompanying vegetables cooked perfectly and fresh. A pricier meal than I usually eat but a very nice Christmas treat, made tastier knowing we were supporting local producers. No room for desert, just a walk along the harbour on the way back to the hotel to burn a little off. A little over three years back in Ottawa and I've lunched at about pretty much everywhere I want to lunch within walking distance of the Parliamentary precinct. So, when Queen Street re-opened to two-way traffic this week and my bus to work was re-routed (to link up with the Parliament O-Train stop which looks like it may actually open at some point) I was happy to see that Queen Street Fare was nearing completion -- and indeed, opened to the public on Friday on Queen between Bank and O'Connor, right accross from the CBC. 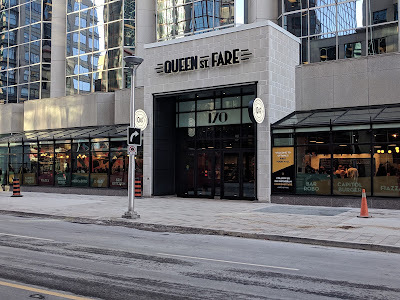 I read a breathless preview about it in the Globe & Mail a few weeks ago, that described it as some sort of new concept in commercial office building food delivery they're calling Ottawa's first Food Hall. Sounded like a fancier food court to me, but whatevs -- another lunching option is always welcome. So I popped over for an early lunch on Friday, hoping to avoid the combined lunch rush/new thing rush, and just barely managed to do so. I would say my earlier take as a fancified food court was borne out. 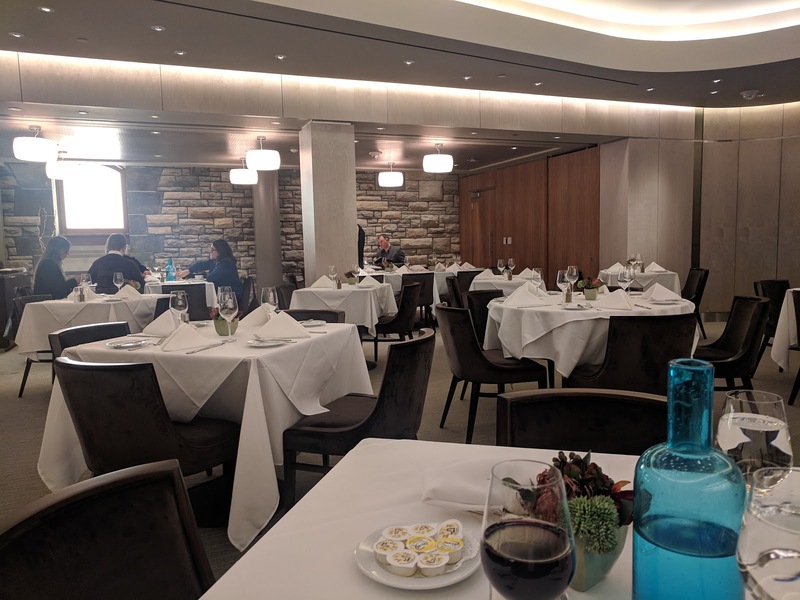 There are a number of different reasturants available, all non-chain operations which is a nice change from a standard food court. I found the layout a bit hap-hazzard with some tight corners to navigate, even were there less people milling about. There's a mix of large communal tables, smaller tables and bar seating. There are a variety of options, including tasty-looking Mexican and grilled oven pizza places I will try in the future. 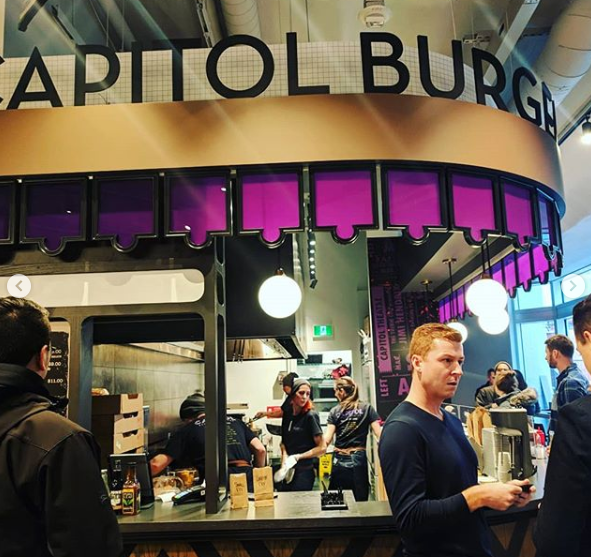 But this day, I had my sights set on Capitol Burger Counter for a burger. Claiming inspiration from the Capitol Theatre which stood on this site until 1970 as a concert venue, its a basic burger, fries and shakes stand -- although the shakes weren't available on this day -- made with locally-sourced ingredients. I decided to pass on the fries as they didn't seem as thin as I tend to like, although they did look crispy and possibly twice-fried. 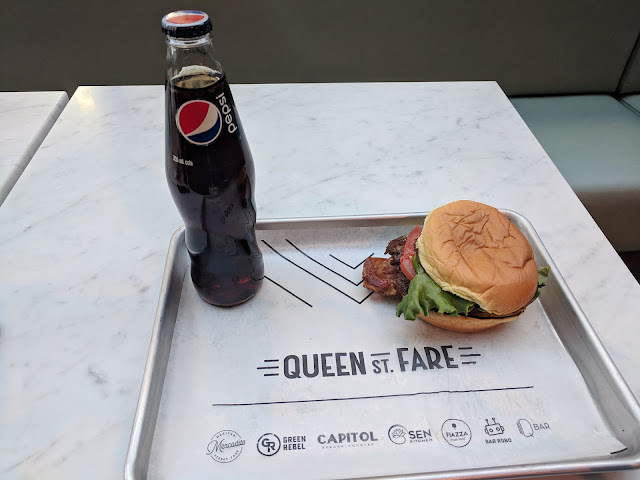 I ordered the Bacon Project -- as did nearly every person in line behind me -- which is basically a bacon cheeseburger with lettuce and tomato (I held the pickes) and their thousand island-inspired special sauce. And for the bevvy, it's all glass bottled options. I opted for a bottle of Pepsi which appeares to be the sugar and not fructose-sweetened variety -- which was nice, as Diet wasn't available. With the open kitchen I could watch them preparing my order. The brioche bun gets a smear of butter before going into the toaster which was nice, although the bun was cold by the time the burger caught up. The beef comes from the fridge in little balls which go onto the grill to be flattened by a griddle -- it reminds me of Smashburger, which I had a few times in trips to Los Angeles. (Smashburger side note: their Filipino owners, who also own Jolibee, told me they do plan to bring Smashburger to Canada in the future). 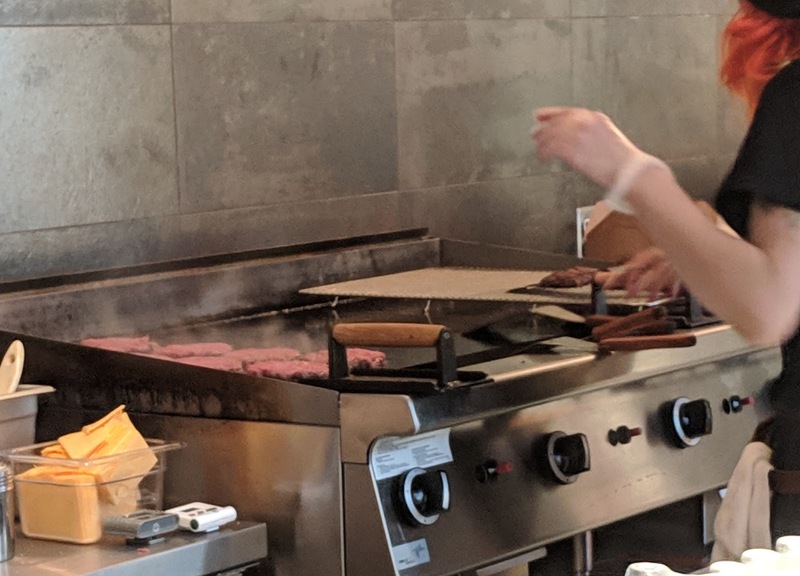 I seemed to have caught them at the beginning of the cycle, as I had to wait while they grilled about 10 burgers from scratch, with my order at the front of the line. But maybe 10 minutes later, I had my burger and Pepsi on a metal tray and went to a communal table to dig in. I mentioned the bun earlier. While I enjoyed the chew of the top contrasting with the toast of the bottom, had lost its toaster heat; but it was still good. A burger comes with two patties, which I'd guess work out to a quarter pound in total. It was tasty and juicy -- not quite Burger's Priest, but certainly the best burger for blocks -- but I felt like $15 for a burger and drink, no fries, pushed the boundaries. On a side note, it wasn't super-clear what to do with the glass bottle -- into the organics or paper recyclables bin? -- so I left it on top, with the trays. Still, a tasty lunch and in interesting concept. I'll be back for future lunches to try out some of the other options. There's also several bars on site, and it turns into more of an entertainment venue in the evenings, with live music and what not. A welcome addition to the downtown Ottawa lunch scene, which is certainly in need of innovation. And a Popeye's Chicken, as I continue to lobby for at every opportunity.